Call ye on the name of your gods, and I will call on the name of the Lord: and the God that answereth by fire, let him be God. Elijah (Hebrew: אֱלִיָּהוּ, Eliyahu, meaning "My God is Yahweh") or Elias (/ɨˈlaɪ.əs/; Greek: Ηλίας, Elías; Arabic:إلياس, Ilyās) was a prophet and a wonder-worker in the northern kingdom of Israel during the reign of Ahab (9th century BC). 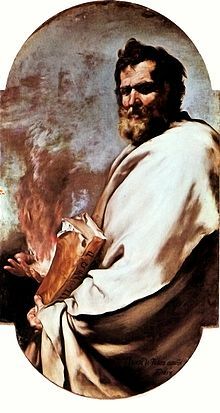 In the Books of Kings he is said to have promoted the worship of Yahweh against idolatries involving the Canaanite Baal, to have raised the dead, brought fire down from the sky, and to have been taken into the heavens in a whirlwind, either accompanied by a chariot and horses of flame or riding in it. 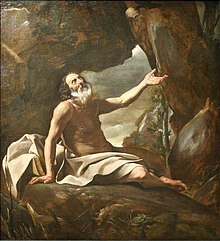 Many later legends arose in which his activities continued, appearing often in the guise of a beggar and scholar; during their own careers, both John the Baptist and Jesus were compared with Elijah and were thought by some to be appearances of him. He is reported to have appeared with Moses during the Transfiguration of Jesus. I, even I only, remain a prophet of the Lord; but Baal's prophets are four hundred and fifty men. Let them therefore give us two bullocks; and let them choose one bullock for themselves, and cut it in pieces, and lay it on wood, and put no fire under: and I will dress the other bullock, and lay it on wood, and put no fire under: And call ye on the name of your gods, and I will call on the name of the Lord: and the God that answereth by fire, let him be God. Now by this I know that thou art a man of God, and that the word of the Lord in thy mouth is truth. Thou hast asked a hard thing: nevertheless, if thou see me when I am taken from thee, it shall be so unto thee; but if not, it shall not be so. My father, my father, the chariot of Israel, and the horsemen thereof. Elijah, when he entered into rivalry with the prophets of Baal became one of them, because God is not to be found in such circuses, nor in the murders which go along with them. At the end of his undeceiving, Elijah is more Yahwist, more atheist, less of a shaman, less of a sacrificer, because God is not like the gods, not even so as to show himself superior to them. And it came to pass after a while, that the brook dried up, because there had been no rain in the land. And the word of the Lord came unto him, saying, Arise, get thee to Zarephath, which belongeth to Zidon, and dwell there: behold, I have commanded a widow woman there to sustain thee. So he arose and went to Zarephath. And when he came to the gate of the city, behold, the widow woman was there gathering of sticks: and he called to her, and said, Fetch me, I pray thee, a little water in a vessel, that I may drink. And as she was going to fetch it, he called to her, and said, Bring me, I pray thee, a morsel of bread in thine hand. And she said, As the Lord thy God liveth, I have not a cake, but an handful of meal in a barrel, and a little oil in a cruse: and, behold, I am gathering two sticks, that I may go in and dress it for me and my son, that we may eat it, and die. And Elijah said unto her, Fear not; go and do as thou hast said: but make me thereof a little cake first, and bring it unto me, and after make for thee and for thy son. For thus saith the Lord God of Israel, The barrel of meal shall not waste, neither shall the cruse of oil fail, until the day that the Lord sendeth rain upon the earth. And she went and did according to the saying of Elijah: and she, and he, and her house, did eat many days. And the barrel of meal wasted not, neither did the cruse of oil fail, according to the word of the Lord, which he spake by Elijah. And it came to pass after these things, that the son of the woman, the mistress of the house, fell sick; and his sickness was so sore, that there was no breath left in him. And she said unto Elijah, What have I to do with thee, O thou man of God? art thou come unto me to call my sin to remembrance, and to slay my son? And he said unto her, Give me thy son. And he took him out of her bosom, and carried him up into a loft, where he abode, and laid him upon his own bed. And he cried unto the Lord, and said, O Lord my God, hast thou also brought evil upon the widow with whom I sojourn, by slaying her son? And he stretched himself upon the child three times, and cried unto the Lord, and said, O Lord my God, I pray thee, let this child's soul come into him again. He himself went a day's journey into the wilderness, and came and sat down under a juniper tree: and he requested for himself that he might die; and said, It is enough; now, O Lord, take away my life; for I am not better than my fathers. And the angel of the Lord came again the second time, and touched him, and said, Arise and eat; because the journey is too great for thee. And he arose, and did eat and drink, and went in the strength of that meat forty days and forty nights unto Horeb the mount of God. And he came thither unto a cave, and lodged there; and, behold, the word of the Lord came to him, and he said unto him, What doest thou here, Elijah? And he said, I have been very jealous for the Lord God of hosts: for the children of Israel have forsaken thy covenant, thrown down thine altars, and slain thy prophets with the sword; and I, even I only, am left; and they seek my life, to take it away. Elijah said unto Elisha, Ask what I shall do for thee, before I be taken away from thee. And Elisha said, I pray thee, let a double portion of thy spirit be upon me. And he said, Thou hast asked a hard thing: nevertheless, if thou see me when I am taken from thee, it shall be so unto thee; but if not, it shall not be so. And Elisha saw it, and he cried, My father, my father, the chariot of Israel, and the horsemen thereof.